TORONTO, ON--(Marketwired - August 24, 2017) - Moms and tots are in for a treat as three brand new series arrive on Télémagino next month. The excitement begins on Monday, September 4 at 4:30 p.m. ET, as the fun-loving Little People make their way onto the network, immediately followed by Bob the Builder and his team of machines. 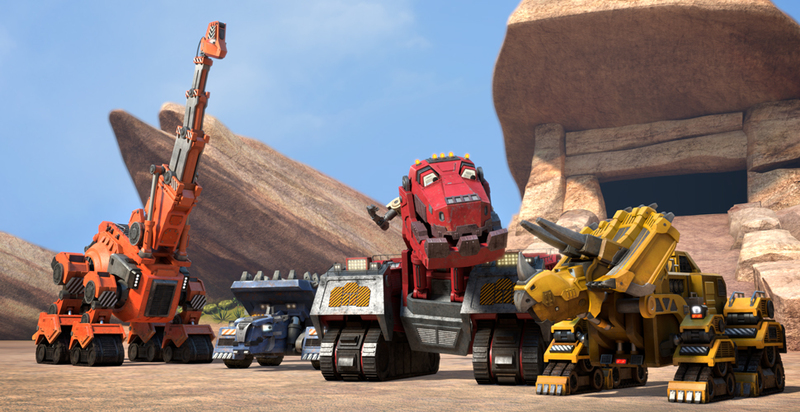 Then, on Monday, September 11 at 5:20 p.m. ET,Ty Rux and his half-dinosaur, half-truck buddies bulldoze into Monday Funday with the series premiere of Dinotrux. Debuting Monday, September 4 at 4:30 p.m. ET, Little People follows five lovable preschool characters as they travel to wherever their imaginations take them. Whether it's a journey to a whimsical farm or to a magical jungle with talking animals, their adventures are always filled with laughter, songs and fun. Each episode instills age-appropriate life lessons like how to wait your turn or how it's always best to tell the truth. Bob the Builder and his machine team are ready to tackle any project that comes their way. As they hammer out solutions that lead to a job well done, Bob and the Can-Do-Crew demonstrate the power of positive thinking, problem solving and teamwork. With every new episode comes a new project and challenge where the team shows that the fun is in getting it done. The construction begins Monday, September 4 at 4:55 p.m. ET, with new episodes every Monday at 4:55 p.m. ET. New from DreamWorks Animation, Dinotrux follows the adventures of Ty Rux, a massive Tyrannosaurus Trux, and his best friend Revvit, a razor-sharp Reptool, as they join forces to battle against the evil D-Structs. The series premieres on Monday, September 11 with new episodes airing daily at 5:20 p.m. ET until Friday, September 15. On September 18, Dinotrux officially joins Télémagino's Monday Funday lineup, airing alongside other DreamWorks series including All Hail King Julien, Dragons: Race to the Edge and The Adventures of Puss in Boots. Télémagino fans can visit Télémagino.ca for character and series information, as well as printable colouring sheets and fun activities. New episodes from all three series will also be available on The Télémagino App and Télémagino OnDemand. Télémagino is a premium, multiplatform channel available to subscribers in French Canada and has a complementary English-language service, Family Jr. Committed to capturing young minds and engaging young hearts, Télémagino inspires imagination and make-believe at every turn with renowned Canadian series and popular preschool brands. Ensuring access is available to subscribers when they want it, where they want it, Télémagino is also available through Télémagino OnDemand and Télémagino Online at no additional cost. Visit us at Telemagino.ca. Dinotrux premieres Monday, September 11. For series images, please visit our media centre.